Good Morning, Gentlemen! It's 68°F/20°C with a clear sky as the sun is beginning to rise behind the trees and houses in the neighborhood. Today will be hot and it should be the last hot day here for the until next year although I said that not too long ago. The hurricane is now making landfall in North Carolina and I'll check up on the latest reports in a couple of minutes. This afternoon I'll do more tear-up work on my model railroad. Some of the rails may not be salvageable and I'm considering just getting new rail. Now smoking a bowl of Straight Grain Flake in the ol' Pete "Rosslare 106", me first mug of coffee close at hand. Hooray it's Friday. A chilly misty morning here in the countryside however they do say the sun will make an appearance around midday....I'm not so sure. Was going to post a pic of the gloom but decided one on the brighter side would be better. Smoking twist in my Falcon... I think for me something on the fruity side is better for this time of day. The Three Friars believe that Burley is proof that the Earth Mother loves us. Thanks I sure do like it. Shopping is done and now for a comforting pipe. Three Nuns in a Guildhall. Morning Greetings Again, Gentlemen! It's warm, bright and sunny In the neighborhood, but cool and comfortable here in the workshop. The North Carolina coast is now being lashed with high winds, torrential rain that's created flooding, and over 400,000 homes are without power so far. The heavy rain alone will last for days! Now smoking a bowl of Wessex Brown VA Flake in the Pete smooth billiard with a refilled and reheated mugga joe on the side. Time to check the latest hurricane news. Last edited by coalsmoke; 09-14-2018 at 15:15. 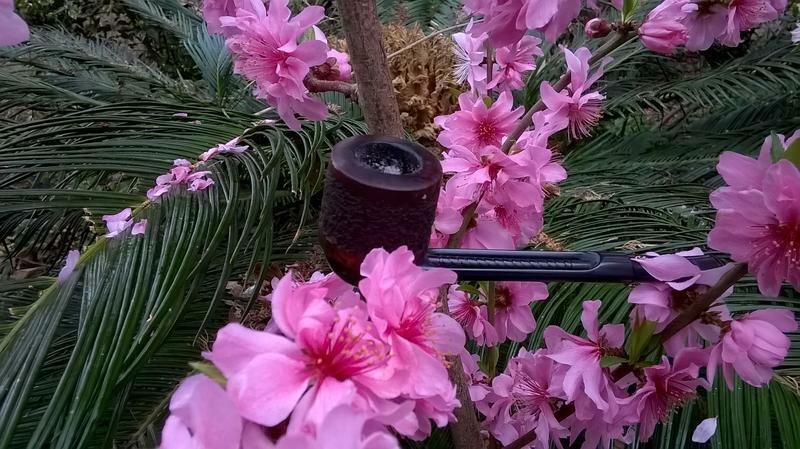 A quarter of the way through this bowl of Edward G. Robinson's Pipe Blend in a 2014 Basil Meadows smooth slight bend squashed tomato with an aluminum band and a black pearl acrylic stem. A bottle of Mountain Dew made with pure cane sugar is my drink. Watching the news. A quarter of the way through this bowl of MacBaren Modern Virginia Flake in a post WW2 Pre-Republic Peterson Dublin straight smooth X155 Bulldog with a sterling silver band and a black vulcanite p-lip stem. Been outside picking up small fallen tree limbs. No damage so far.